Lately I’ve been creating on My Digital Studio and for this week’s challenge at Hand Stamped Sentiments I have created this Christmas Card. Creating photo boxes and sizing them to your liking then filling with your choice of paper is how I created the glimmer strips and the strip of Season of Style DSP at the top of the card. 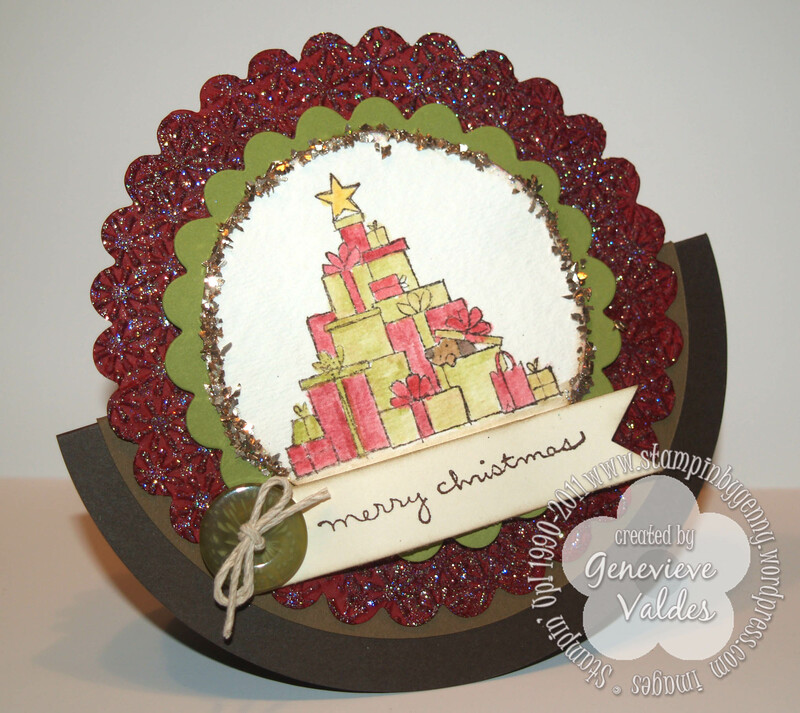 If you have MDS and haven’t used it in awhile, I invite you to create a card or scrap page using it. If you don’t have MDS and would like to try before you buy click here for a FREE trial. This week at Hand Stamped Sentiments we have a fun challenge – Fancy Fold Cards. With only few more days left till Christmas I decided to make another Christmas card but with a rocking twist. I had seen this type of card out in internet land and decided to make a rocking Christmas card. You can view a tutorial for making this card here. They’re so easy to create! I cut an Early Espresso 5″ circle and a 4-1/2″ Soft Suede circle with my Circle Scissor Plus then folded them in half and glued them together. The Scallop Circle Cherry Cobbler layer is embossed with the Snow Burst embossing folder and heat embossed with Iridescent Ice embossing powder. I used the Scallop Circle and Scallop Circle #2 dies to cut the Cherry Cobbler Scallop Circle and the Lucky Limeade Scallop Circle. The Gift image is stamped on watercolor paper with brown StayzOn and colored with ink pads and a blender pen. I used the Circle Scissor Plus to cut out this layer at 2-3/4″ . To add some more sparkle I framed it with Champagne Glass glitter. I added an Old Olive button and stamped ‘Merry Christmas’ in Early Espresso on Very Vanilla. For the back of the card I stamped the bird and ornament image on water color paper then punched with the ornament punch. I also used ink pads and a blender pen to color. I stamped snowflakes and heat embossed them in gold along with the sentiment. Hop on over to HSS for more inspiration from out very talented Design Team. 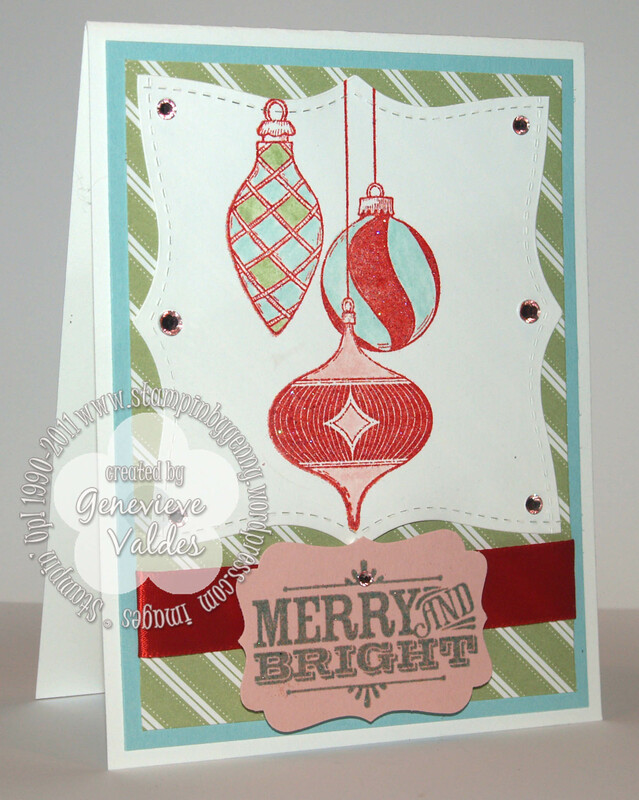 This week at Hand Stamped Sentiments we have a color challenge. Create any project with the colors of Blushing Bride, Pool Party, Pear Pizzazz and Real Red. Since I’ve been in the groove making Christmas cards with the Merry and Type stamp set and coordinating DSP I created a Christmas card with these non-traditional colors. Do you recognize the Whisper White square shape? It’s the Top Note Die. I die cut the shape as you would normally then I turned the cut Top Note 90 degrees and centered it then ran it through the Big Shot again. Very easy! The ornament image is stamped with Versamark and Real Red then heat embossed with Iridescent Embossing powder. To color the ornaments I used a blender pen and ink pads. To add some additional sparkle I embellished with light pink rhinestones. I used a light colored pink Sharpie to color them. The sentiment is stamped with Pool Party and Versamark. I then heat embossed it with Iridescent Embossing Powder to add some sparkle. I used the the Decorative Label to punch it out then layered it over Real Red satin ribbon. I hope you’re inspired to create a project with these colors. 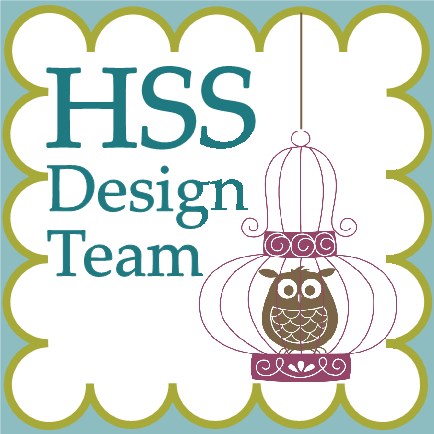 Hop on over to HSS to be inspired by our talented design team.